An appellation is a geographical area recognized for a distinctive combination of soil, climate, and identifiable regional wine character. The word appellation comes from the French Appellation d'Origine Controlee laws, which are laws meant to ensure quality within specific regions of France. These same principles have been used to create American Viticultural Areas (AVA) in the United States. 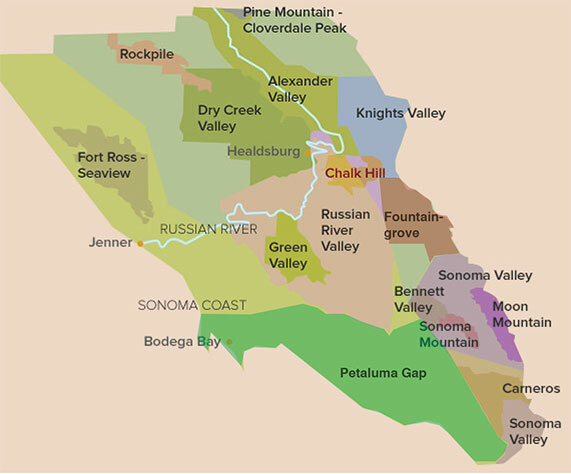 Green Valley is one of the smallest appellations in Sonoma County. It lies in the southwestern part of the Russian River Valley, bounded by the towns of Sebastopol, Forestville and Occidental. It is very tightly delineated, both geographically and climatically, and is the most consistent of any North Coast appellation in terms of soil, climate and flavor. The fog is Green Valley’s trademark. The predominant soil type (60%) of this American Viticultural Area (AVA) is Goldridge soil, the most sought-after type in Sonoma County—especially for Pinot Noir.